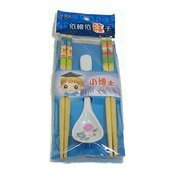 Description: 19cm Chopsticks (2 pairs) and 14.5cm spoon set. Perfect gift for introducing kids to oriental cuisine. Simply enter your details below and we will send you an e-mail when “Children Chopstick & Spoon Set (小童筷子/匙舀套裝禮包)” is back in stock!